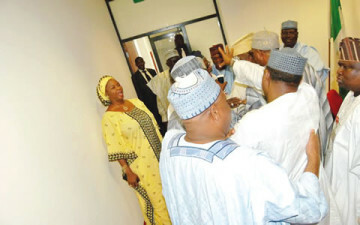 An argument between two All Progressives Congress Senators, Kabiru Marafa and Tayo Alasoadura, degenerated into a physical combat on Tuesday as a last minute attempt by the party’s caucus in the Senate to select the principal officers ended in a stalemate. The meeting of the caucus was convened in Abuja by the Senate President, Bukola Saraki, to unite members of his group, the Like Minds Senators and those loyal to Senator Ahmad Lawan, the Senate Unity Forum. The meeting was also aimed at arriving at a common position on the selection of principal officers. Trouble was said to have started immediately after Saraki had delivered his speech and urged his colleagues to dissolve into zonal caucuses to produce their representatives for the posts of Senate Leader, the Deputy Senate Leader, the Chief Whip and the Deputy Whip. It was at that stage that Senator Suleiman Hunkunyi, got angry on hearing Saraki’s call on members to dissolve into zonal caucuses. Hunkunyi disagreed openly with Saraki on the issue and insisted that the meeting should rather ratify the names already sent to his (Saraki) office by the APC leadership on Tuesday. According to him, the party had forwarded a letter which recommended Senator Ahmad Lawan as Senate Leader; George Akume as deputy leader; Olusola Adeyeye as Chief Whip; and Abu Ibrahim as deputy whip. The action of the Kaduna State-born senator infuriated some of his colleagues in the Saraki camp, who disagreed with the list allegedly sent by the APC Chairman, John Odigie-Oyegun. They maintained that the Senate caucuses would determine their representatives. During the commotion, Tayo Alasoadura, an APC senator faulted the choice of Adeyeye and wondered why the party did not choose Senator Ajayi Boroffice, who, according to him, is also qualified for the position. It was at that stage that Marafa, who felt that the Like Minds senators were trying to scuttle the party’s position , reacted angrily to the opinion expressed by Alasoadura.